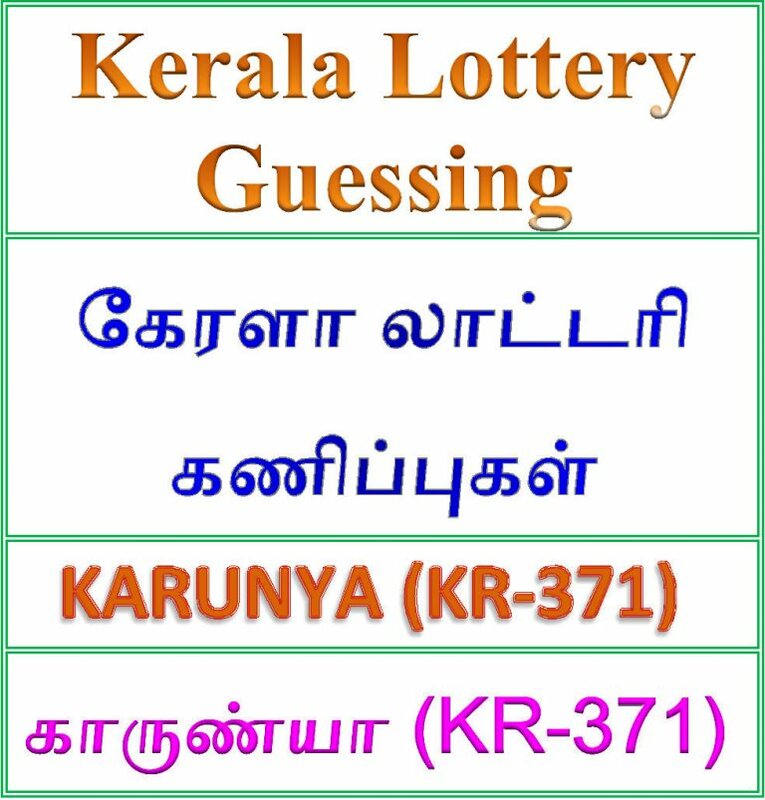 Kerala lottery guessing / predictions for KARUNYA KR-371 dated 17.11.2018. 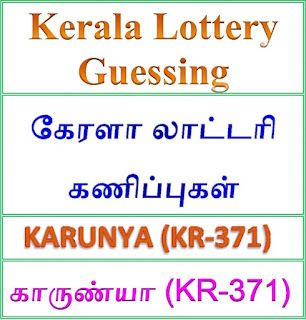 Winning number predictions of weekly lottery KARUNYA KR-371 on 17 November 2018. Best possible winning numbers published below. These guessing number are just our and our visitors predictions.People who are interested in Kerala lotteries use may ways to forecast the winning numbers with many methods of speculations. 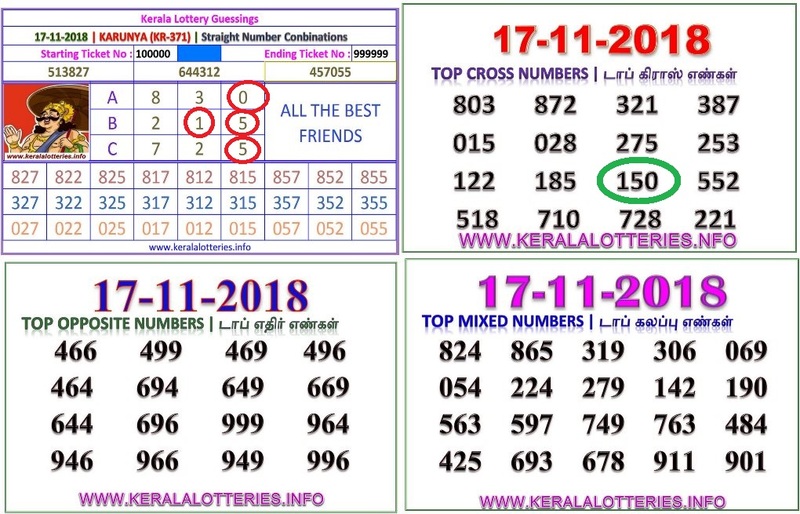 These are not any leaked Kerala lottery result or confirmed Kerala lottery result.Predictions of KARUNYA KR-371 lottery is only a speculative game for fun and increase the curiosity on the draw of KARUNYA KR-371 Lottery held on 17.11.2018. A = 3 - 7. B = 1 - 2. 11/16/2018 15:56:19 Prabhu CBE (A). 4..3..2 ( B ) 7.8.1.9.6. 11/17/2018 4:23:44 Hariharan Tirupur All borad 0,3,9. 11/17/2018 6:55:30 jeevakumar sowripalayam 374.347.678.687.786.768.876.867.894.898.895.859.897.808.858. 11/17/2018 10:00:10 Anand Vpm B. 8. 11/17/2018 12:42:08 zaffer Kkl 193.913.931.319.139.003.030. 11/17/2018 13:21:51 farook.k True. unniyal 050.550.950.555.959. 11/17/2018 14:27:51 Prem kumar Vella kovil 289...239....269....219....296...291...781...768....701....017....718....538....899....866....628...188....261....463...961...928...411....781...843...643......A.C.....21...25...23...28....71...75...73...78...81...85...83...88....91...93...95...98..